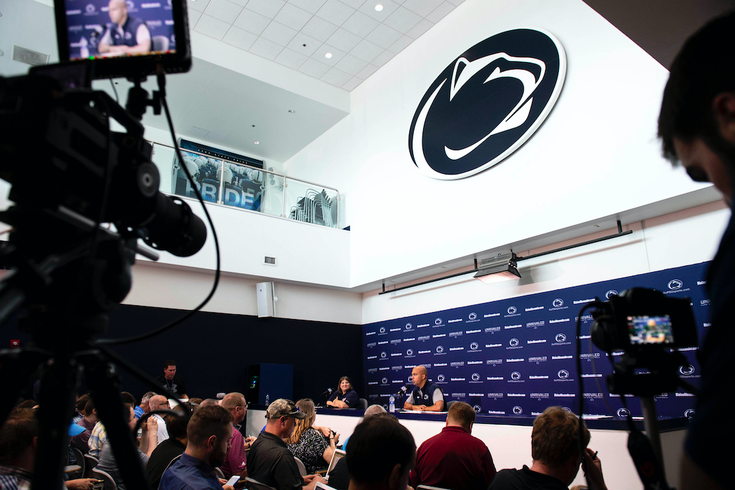 Penn State head coach James Franklin speaks with media during media day at Beaver Stadium on Saturday, August 4, 2018. The FBI and Penn State Police are investigating a social media threat targeting a home football game at Beaver Stadium during the upcoming college football season. In a tweet Wednesday, an account that has since been deleted threatening to commit a mass shooting at the stadium. In a follow-up tweet, Penn State Police said they are working with the FBI to determine the credibility of the threat. "The safety of our students, faculty, staff and visitors is paramount," the university said in a statement. "Penn State takes all threats very seriously and University Police and federal authorities are actively investigating. As always, University Police encourages everyone to always be vigilant." The Nittany Lions kick off the 2018 season at home against Appalachian State University on Sept. 1.